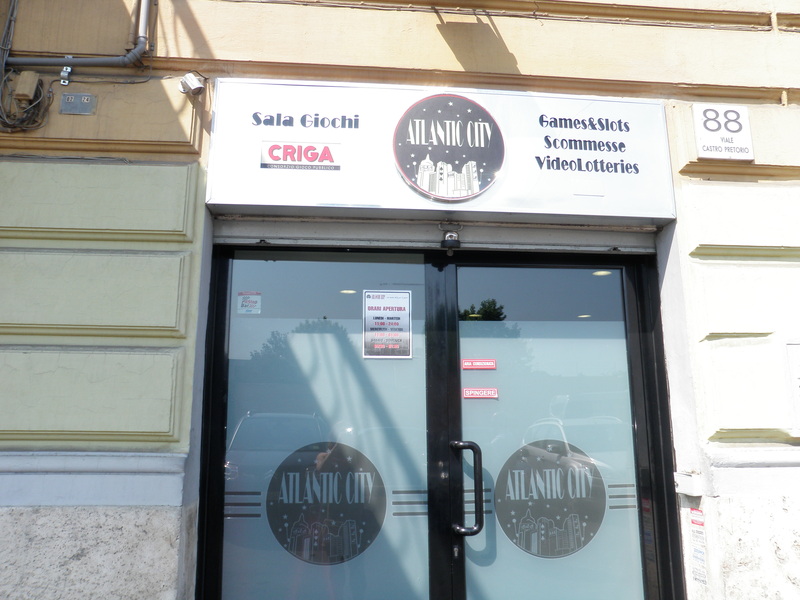 Just when you think you’re beginning to get homesick, you find a little piece of home right around the corner from your hotel. Nothing like Atlantic City, Rome style. The best part of day three was to get to see museum science in action. I LOVE THIS STUFF! I mean I have considered being a conservator just so I can discover the history and original form of objects…but I guess I love designing exhibitions more. 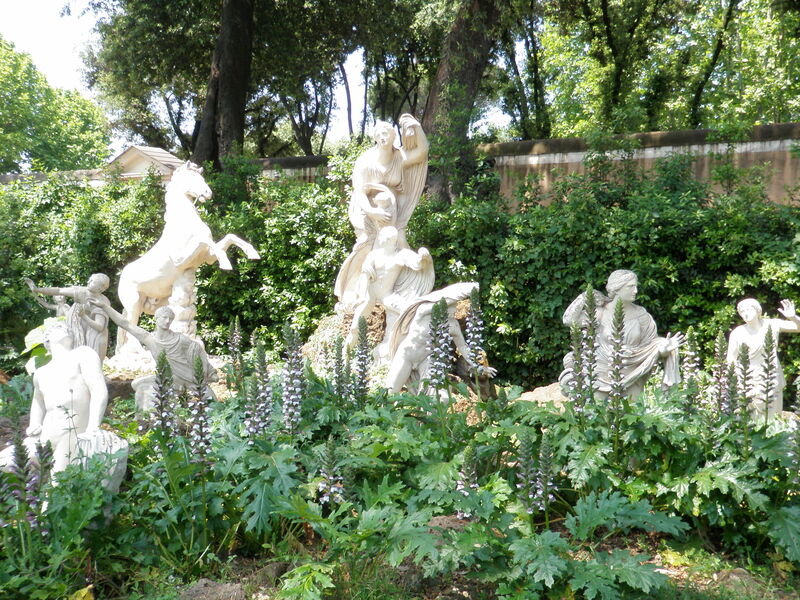 First stop was at the Villa Medici with a tour of the AMAZING garden and labyrinth. Inside we saw the special exhibition “Poussin and Moses: From Drawing to Tapestry” and something that was very interesting about the exhibition space was a fairly steep incline with “stairs”. They were really stairs though because each rise was only a few inches and the flat of each stair was a few feet. Charlotte’s (my professor), husband, Derek, enlightened me as to the origin of such stairs. 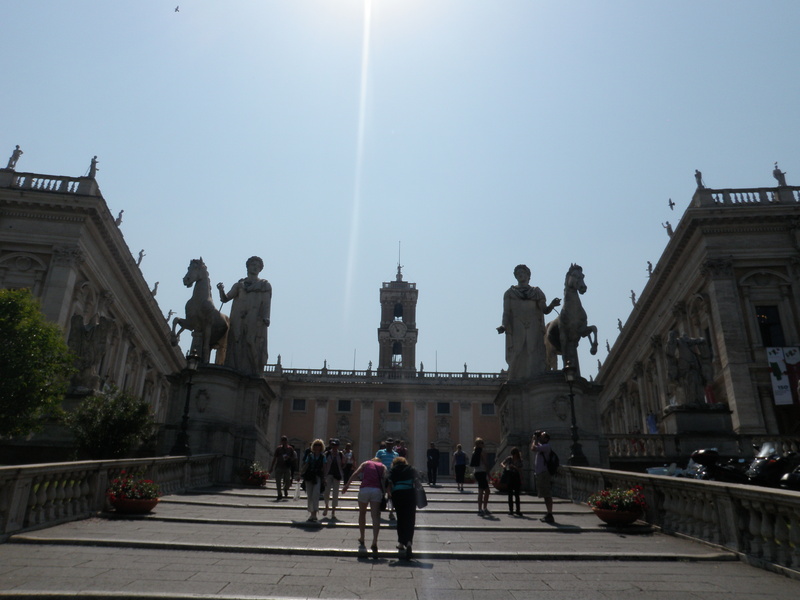 Villa Medici is built on a large hill and horse stable was located farther up the hill, the stairs were built to be useable by the horses. Learn something random all the time. 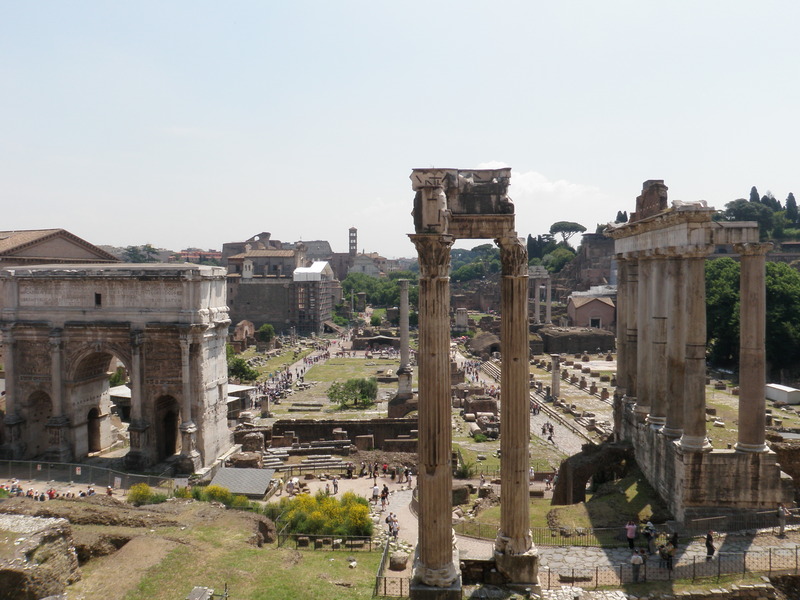 The structure was built in 1564 on the ruins of a 2nd century villa, the walls and structure were ornamented with 1st and 2nd century antiquities, like the piece of freize from the Ara Pacis (you’ll hear about that later) who now has a replica piece. The Medicis made their start in banking and devised double entry ledger writing. Along with bringing in a fortune Lorenzo began bringing many artists and musicians to the household until it became a sort of school, which it still is. Twenty-four artists come from France at a time to stay at Villa Medici, now the French Academy, in order to study in Italy. The garden is very typical Italian, notice there are no flowers. 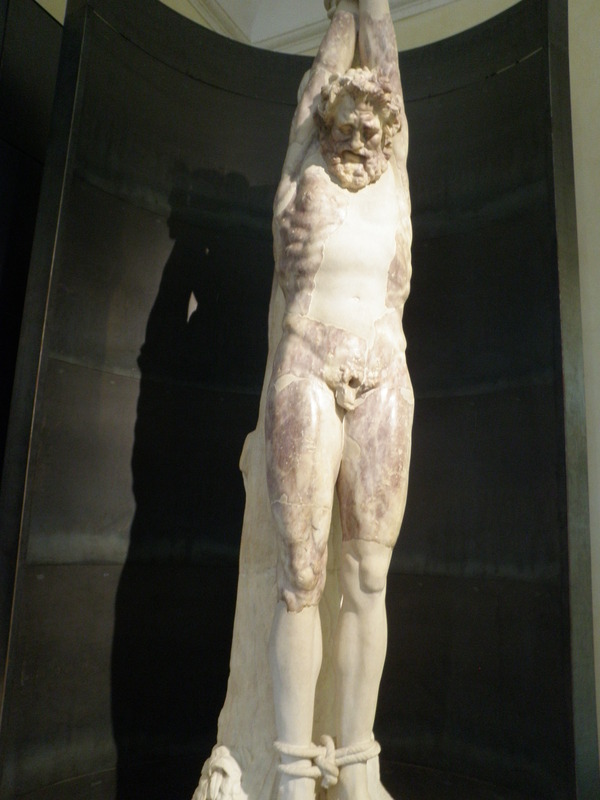 Original Italian thought was that man is the center of the universe so he should have complete control over his things. Bushes you can prune and control, flowers you cannot. Thus the lack of flowers. My favorite thing in the gardens was the mini sculpture garden depicting the massacre of Niobe’s children. Essentially Apollo and Artemis were jealous that Niobe had been able to have fourteen children so they killed them all. For a much more informative and romantic version of the story read here. The first interesting piece of science for the day you’ll see below. A room in one of the towers of Villa Medici where you can see they have literally peeled through time back through consecutive layers of paint. It’s like Christmas and unwrapping the same present with a million different layer of paper, the suspense! 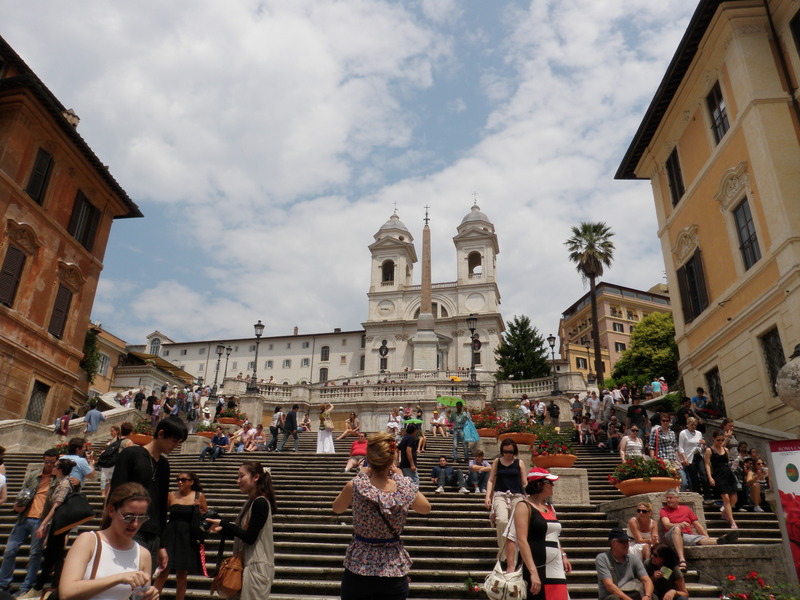 Next we wandered down the Spanish Steps (actually built by the French) to the Keats-Shelley Museum where we had a tour by the most darling little Irishmen. Saying that makes him sound old, he wasn’t but he was just pint sized and spritely. This was the final home of John Keats, the poet, who died from tuberculosis after a truly tragic life. Those of you who know me, know how I feel about the mixing of the old and new. Incredibly torn. Sometimes I love it, but most times I really hate it. 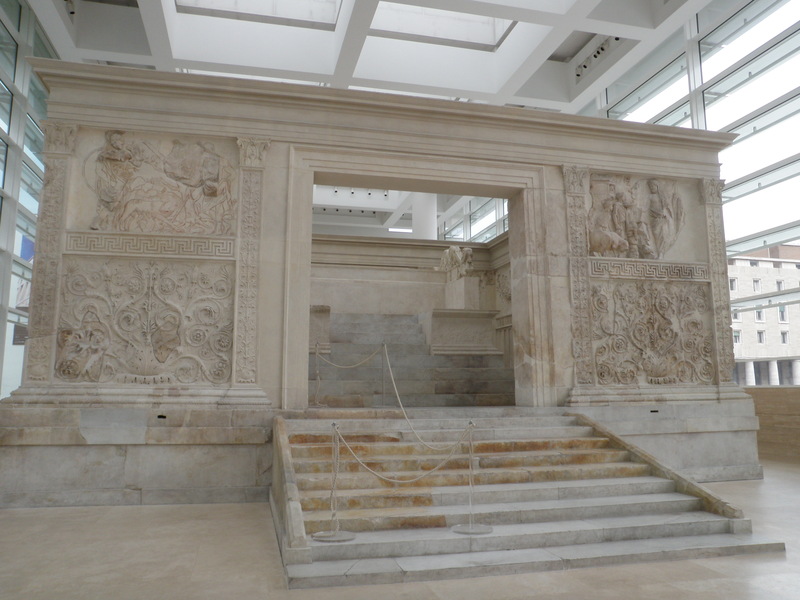 One instance where I really disliked it was the Museo Ara Pacis Augustae where the Ara Pacis (Alter of Peace) dating is enclosed in a piece of architecture by Richard Meier. It’s just a big empty, stark, waste of good museum space. 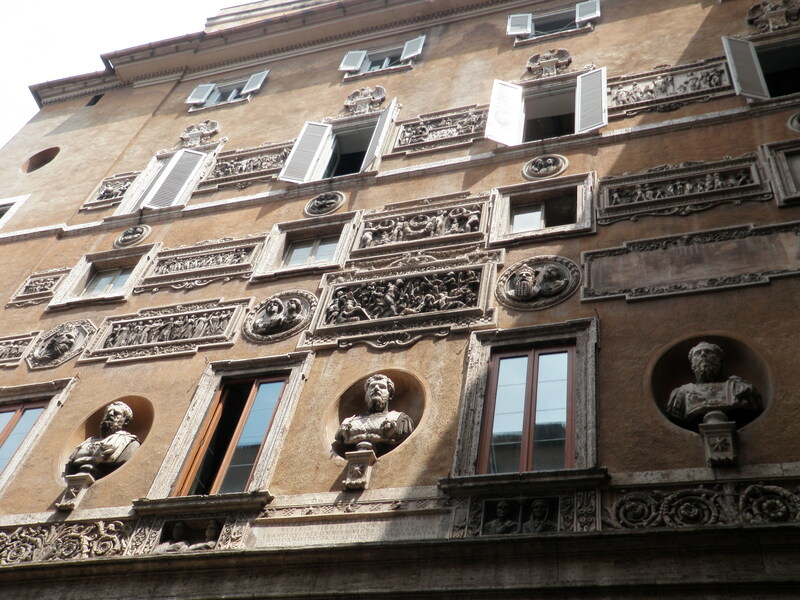 The interesting thing about marble in Rome is that when you see it now it’s whites, tans and browns. 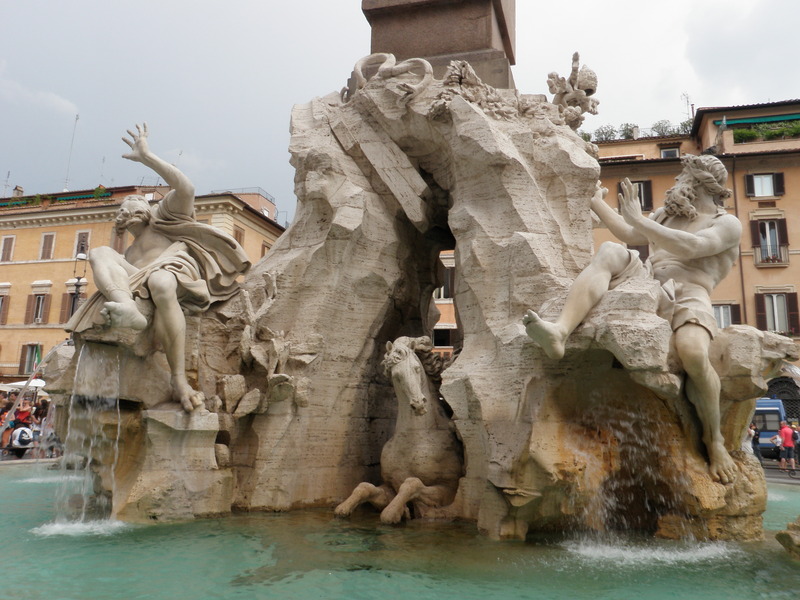 Had you seen it when it was created a large majority of sculpture and architecture would have been brightly painted. You can’t get much of the context from this photo but it shows the science of trying to find out what colors would have been used on which areas of the Ara Pacis. 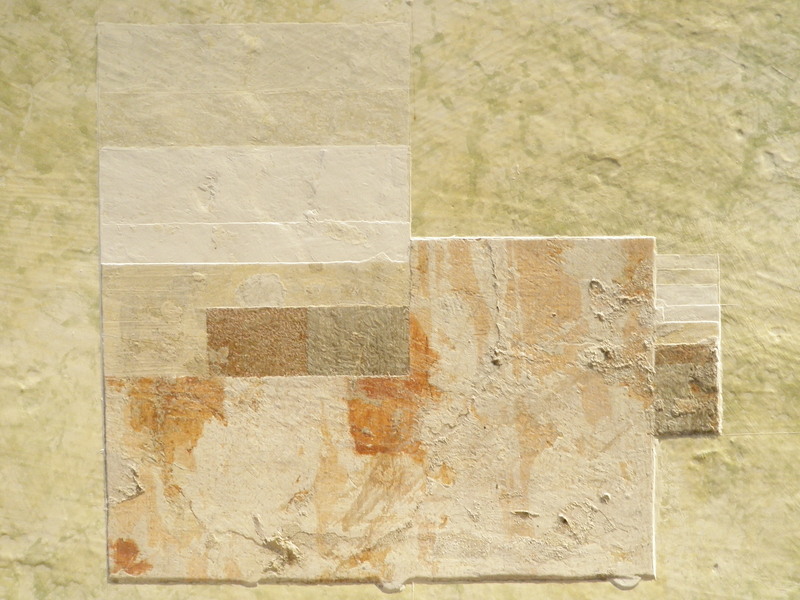 What the colors on the outside of Ara Pacis would have actually been. Next, another of the Roman hills, this time Janiculum Hill where they have restored sculpture for the the 150th Anniversary of the unification of Italy. Another BEAUTIFUL view. We finished the evening at the American Academy in Rome. 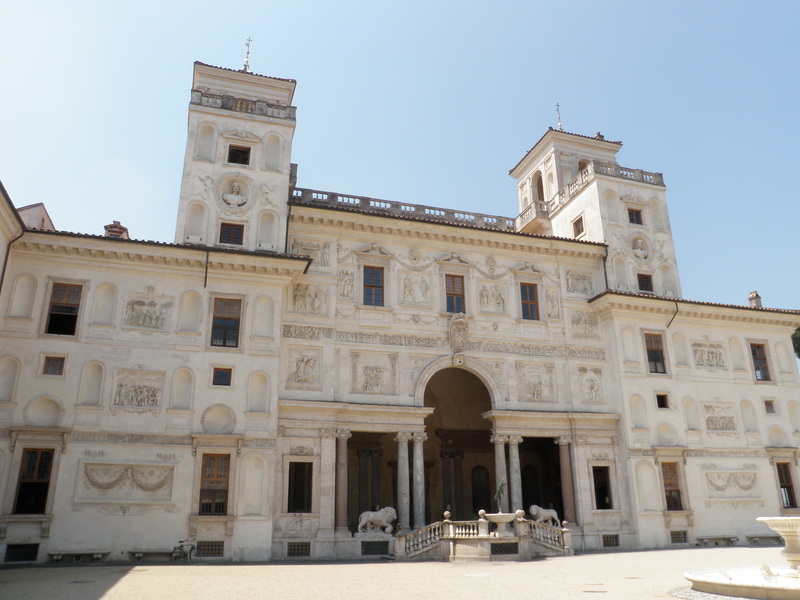 It serves a purpose similar to that of the French Academy at Villa Medici. 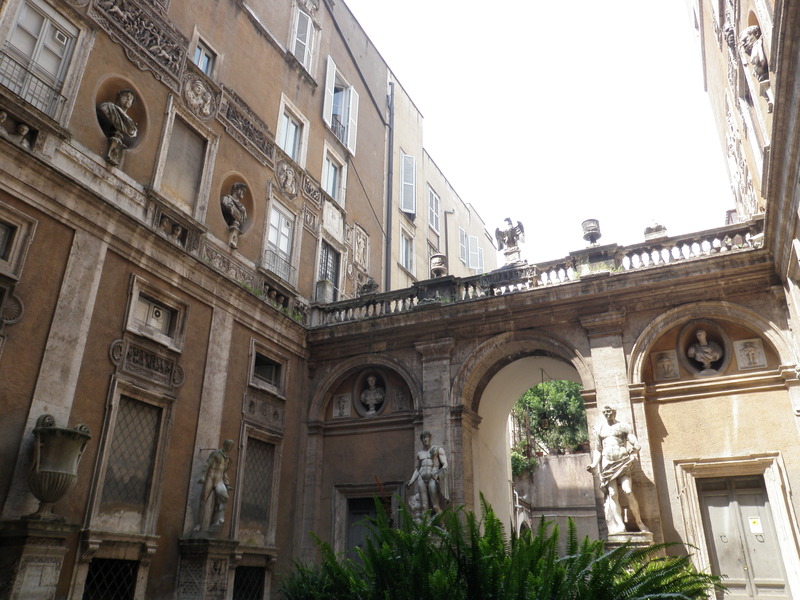 Students and/or artists may reside here to study and practice in Rome and enjoy the Italian Culture. As it was an open house we were able to view many of the current residents work and studios. 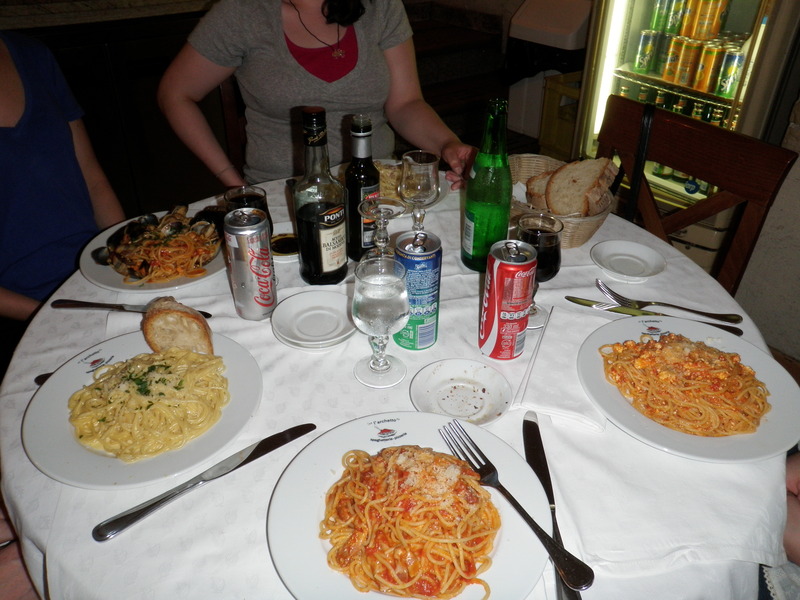 Dinner tonight was at La Tana dei Noiantri inTrastavere which seems to be the hopping place for the teens to thirty somethings crowd. Pizza, again. Delish. I can’t help it. 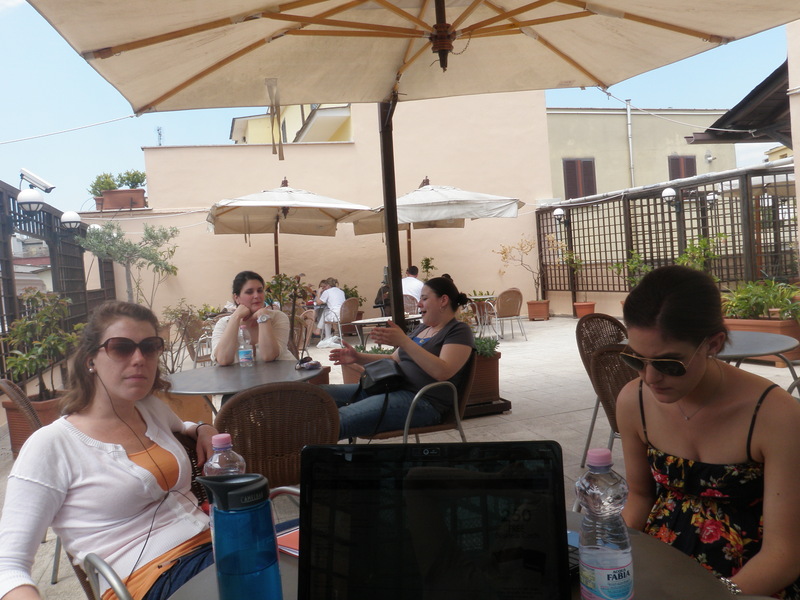 It is now my fifth day in Rome and I’m just getting a chance to write about my first day. 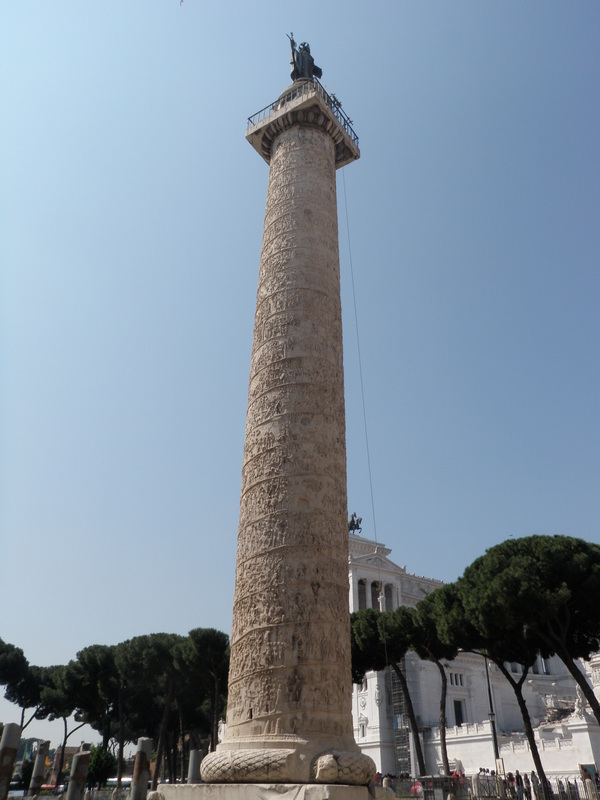 I’m visiting for May term for school and doing an insanely intense 10 day cram of Rome. It’s been fascinating so far, you know me, I love old stuff! 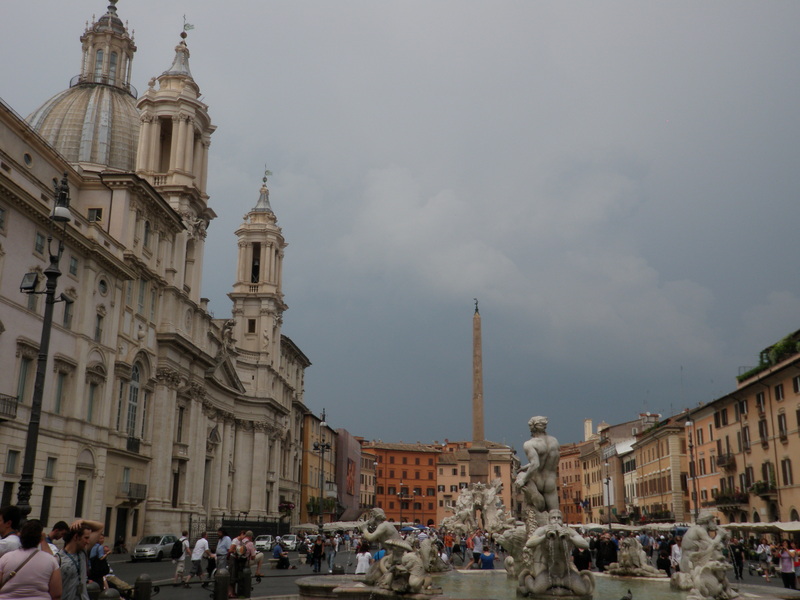 Arriving in Rome was a typical foreign travel fiasco as expected; screaming babies and coughing ladies on the plane, creepy people on the train and bad directions to the hostel so I ended up walking with my luggage way more than was necessary. The hostel is fairly nice and clean and located closely to the train station. The community bathrooms are fortunately at least combated by a pretty sweet rooftop terrace. Day one was exhausting. I left Newark, NJ at 4:50 p.m. and arrived in Rome at 1:15 a.m., 7:15 a.m. Roman time without a wink of sleep. We started at 3:30 in the afternoon at the Colosseum. 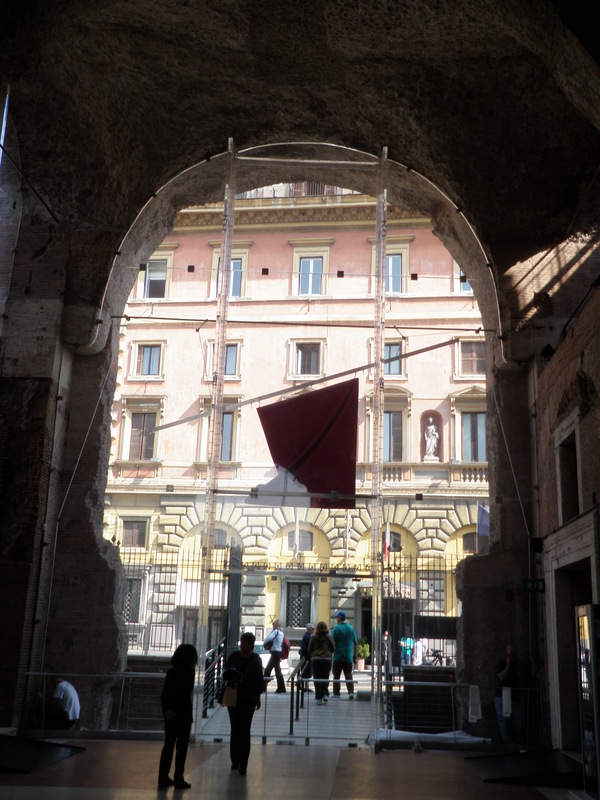 The thing I’m enjoying the most is the fact there can be bsolutely NO separation of the old and the new in Rome. There are literally buildings ranging from the year 72 to 2011 standing side beside all throughout the city. 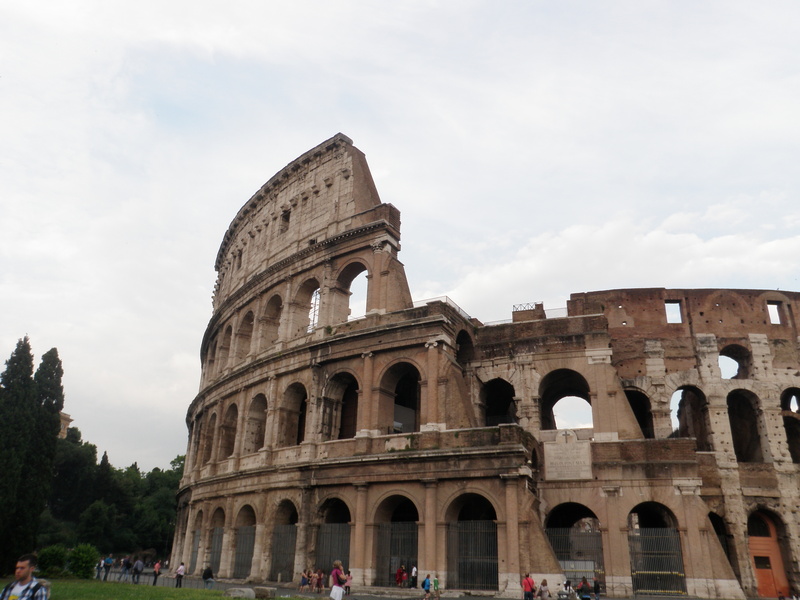 The Colosseum (built AD 72-80) is huge and includes an extremely interesting history. 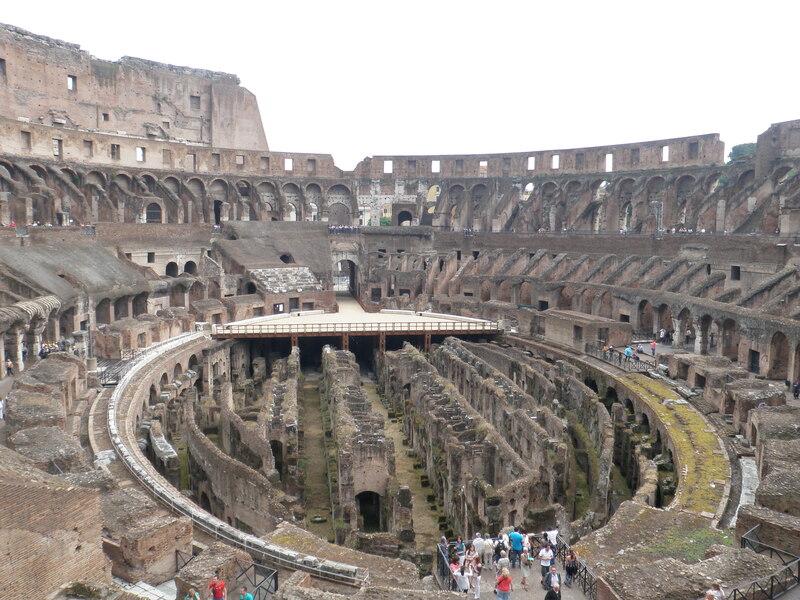 This structure was originally a huge amphitheater and entertainment arena. Unlike nowadays where we play football and hockey, they fought bulls and lions and raced ostriches. So, looking at the photographs imagine a solid floor over the labyrinth of brick walls in the base of the arena. This is obviously where all the fighting would have gone down and the tunnels below are where the warriors or prisoners and animals were kept between fights. 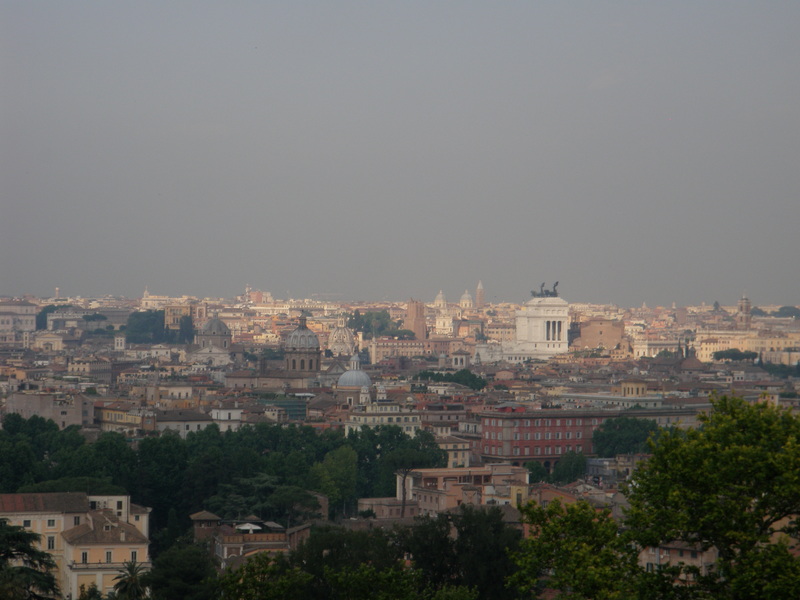 Next, we enjoyed a scenic and information perusal up Palatine Hill: which is one of the seven famous hills of Rome. 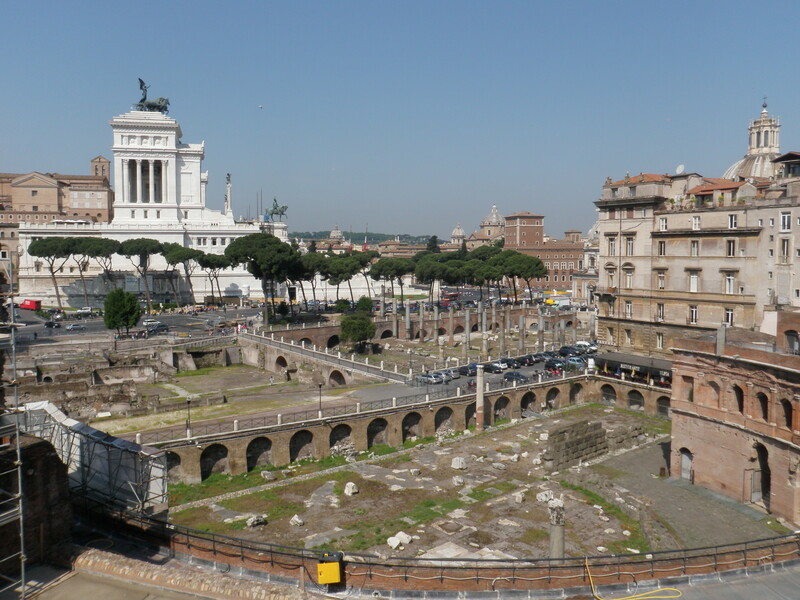 We saw the Arch of Constantine, the remains of some old aqueducts (always strangely cool), and we went into the Palatine Antiquarium Museum at the top of the hill and enjoyed some beautiful views of Rome from this very “parkesque” site. From here my professor and her husband were able to orient us to the city of Rome, utilizing many of the most famous buildings (and places we would be going) as markers. We received excellent advice from Charlotte (our prof) about riding on public transportation, “Keep your hands on your business!” meaning our purses. Oh, Charlotte. 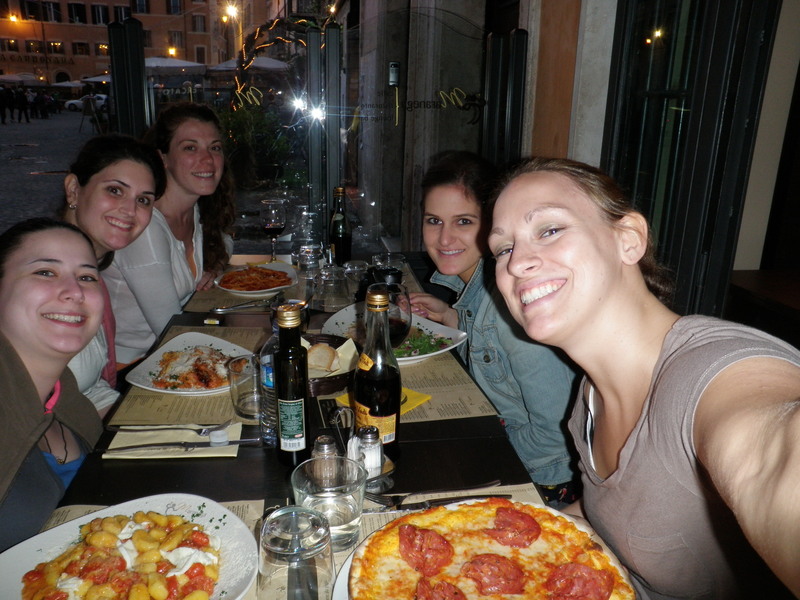 Last but not least, always the best part of the day was dinner at Maranega’s at the Campo de’Fiori. I had a spicy salame pizza that was unfortunately nowhere near as tasty as Manny’s. I have discovered, however, that Manny’s is most definitely a “Roman style” pizza. Long day and a big meal meant right back to the hostel to reenergize for a super-charged Tuesday! More than two months since my last post, tsk tsk. This semester has really gotten away from me. I promise my lack of blogging isn’t because there aren’t many fascinating things happening in the museum field, because there are. It’s simply because at I spend 40 hours a week playing manager at a local gourmet foods market, 20 hours a week as a graduate assistant and go to class three night a week. I daresay I’m just a bit busy. Excuses aside, the semester and finals are winding down but things in general won’t be slowing down at all. I do hope to have more time for blogging though. I have several posts written, I just need to type them up and post them. 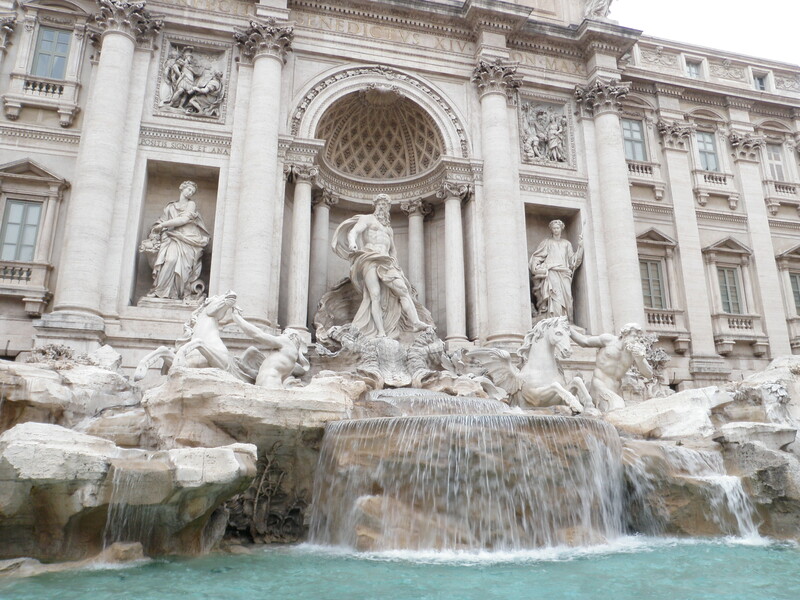 May term week in ROME!!!! 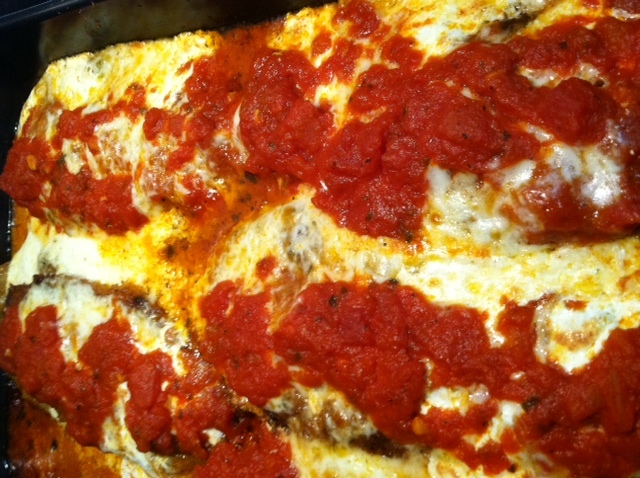 Lots of amazing eats and recipes with the man! There you have, 10 FASCINATING things to look forward to! 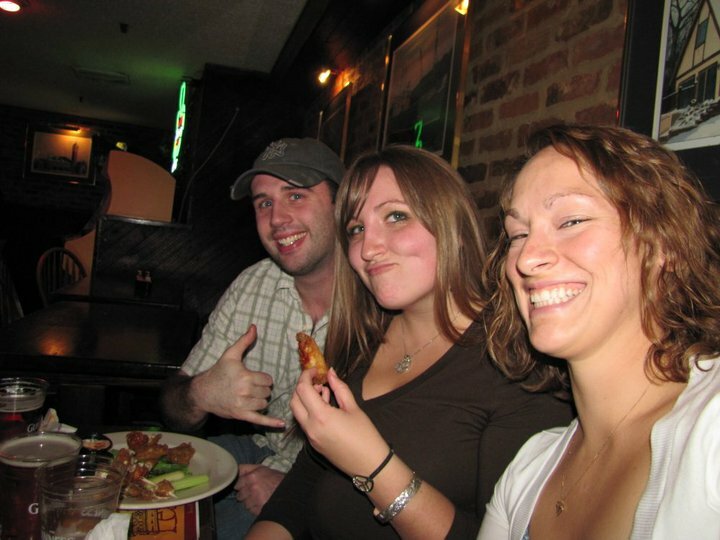 The only thing productive about Pub Trivia is delicious wings. I’m doubling on this post, I originally wrote it for the Seton Hall MAMP Newsletter. Thought it might be of interest here! There are an estimated 150 million blogs (Blogpulse) on the web and it is likely at least another ten will be created while you read this article. So then, why should you write a blog? It’s just another thing to do – sort of like having homework, right? Instead, you could be watching Mad Men, reading Cosmo or attending pub trivia. It is a difficult decision. When I first started my blog, years ago, it was a way for my family and friends to keep tabs on me while studying abroad. Now, much later, it has become one of the best learning tools in my career. 1. It keeps you informed of issues and news. You can write on any topic that interests you. Research the topic for 10-15 minutes, gather your thoughts and write about your perspective. You might be surprised, both at how well you stay informed and at the conversation you start. 2. It hones your writing. Who doesn’t need a little writing practice? Beginning a blog is one of the best ways I’ve found to learn a happy median in writing for experts, enthusiasts and the general public all at the same time. This is a skill many of us must use at work every day. 3. Provides excellent networking opportunities. As you begin reading and commenting on other blogs, those writers will inevitably start to reciprocate. Before you know it, you’ve connected with somebody you may not have met otherwise. Likewise, it is an excellent way to continue conversation with professionals you’ve met at conferences or seminars. 4. Makes you aware of events and exhibitions (and potentially gives you inside access to institutions and their “muselebrities”). 5. It facilitates self-branding and boosts your résumé. Maintaining a blog shows potential employers that you’re diligent, aware and tech savvy. If you’re looking to add something to your résumé that will set you apart from the crowd, an interesting blog might be just the thing. If you’re self-conscious about your writing or about beginning a blog, than start small. You can keep a blog private, or only give the link to a handful of friends until you feel comfortable enough to let it go public. Another excellent option is to test the waters by writing a guest post. Contact the writer of a blog you enjoy and make a suggestion, or consider guest-writing for the Mid-Atlantic Association of Museums blog. They are always looking for students/professionals who would like to write about anything that might interest readers. Blogging is a worthwhile investment of your time and a great way to bounce around ideas. You’ll find plenty of other great tips and tricks at (http://weblogs.about.com/od/bloggingtips/tp/TipsBeginnerBloggers.htm). Sneak Peek at the Metropolitan Museum of Art! First things first, this post would have been written hours ago if not for The National Trust for Historic Preservation’s new real estate website. Someday, I will buy my home from this very site. I would like the Italian Villa that is listed right now and if you would like to donate to the cause, please let me know. An excellent thing I’m finding about grad school is the great privilege of having professors with no shame; professors who are willing to call up just about ANYBODY and ask them for a tour, or to come talk to one of our classes. The students in the Seton Hall Museum Professions department (myself included) have had an amazing semester. 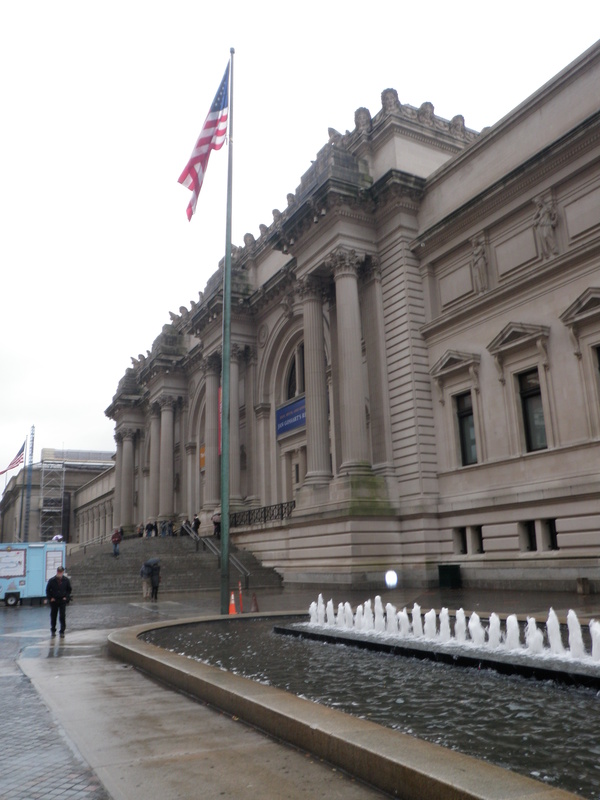 The Metropolitan Museum of Art brightens any dreary day! Tuesday, for Exhibitions A to Z (Steve Miller is the possibly the King of shameless opportunity seeking) we had a 2 ½ hour tour at the Metropolitan Museum of Art (MET) in NYC. Let me just say, celebrity to some people includes Brad Pitt or Whoopi Goldberg, to me big time museum people are my celebrities. Our tour was with Michael Batista, Exhibition Design Manager at the MET and Sophia Geronimus, Graphic Design Manager, who joined us for the first portion of our tour. How amazing to meet these people who are the BEST of the BEST in our field! A big thank you to both of them. Our visit began with a literal walk-through of the exhibition The World of Khubilai Khan: Chinese Art in the Yuan Dynasty on display September 28, 2010- January 2, 2011. I can’t wait to go back and actually SEE this exhibition; there are some 300 amazing artifacts! Michael and Sophia talked us through their process of everything they do in planning an exhibition. I think the biggest point that was stressed was how incredibly important communication is. When you have many different people, from different fields/specialties and often IN different countries, it is imperative everybody be on the same page. Michael showed us the exhibition floor plan and model of the exhibition, and what a treat it was. To actually see that whole process in front of you is much different than just talking about it in the classroom. Second, we went into the The Artistic Furniture of Charles Rohlfs exhibition. You all, of course, know my love of the Arts and Crafts Movement. This furniture takes it to a whole new level, wow. 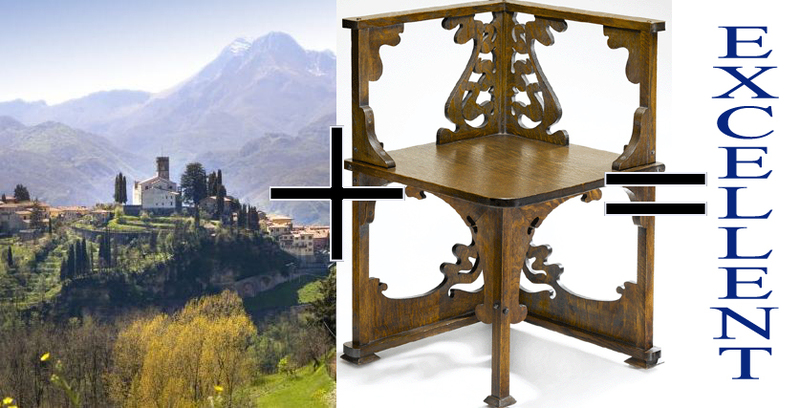 Thought it in no way goes together I will be buying the Italian Villa from the Preservation Nation real estate site and filling it with FLlW, Stickley and Rohlfs furniture. How do you like that? Photographs from http://historicrealestate.preservationnation.org and http://www.macklowegallery.com respectively. Last, but the MOST EXCITING! Michael took us into the new Islamic Wing of the Museum. It won’t actually be called that, it will be the Galleries for the Arts of the Arab Lands, Turkey, Iran, Central Asia, and Later South Asia. What’s exciting about this you might ask? The fact that THEY AREN’T OPEN YET! They won’t actually be opening until fall of 2010, but we had a sneek peek! I’m not going to tell you much, you’ll have to go see for yourself, but it’s going to be beautiful! 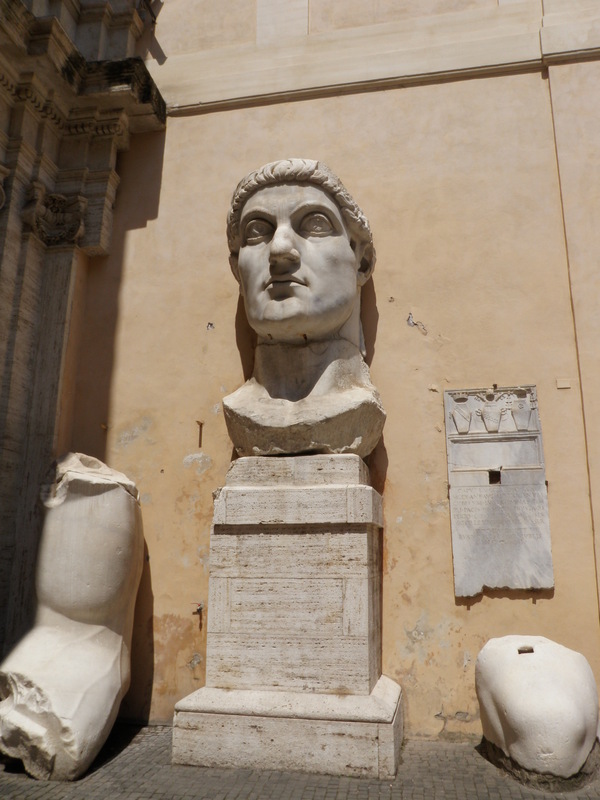 Lots of art AND marble from all over the world. Again, we got to see another part of the process. The building stage, something you definitely don’t get the full perspective on in the classroom. Interesting fact: The MET ACTUALLY cut a hole in the façade of the museum to bring in materials for the new Islamic exhibition space. There is NO LIMIT to what we museum people will do to make the absolute BEST exhibitions we can for the public. Seriously, they just cut a hole in the side of the museum, I love it! So, I blog all about my conference and launch my new website only to leave it for a couple of weeks. It’s hitting crunch time of the semester and things are beginning to become urgent. I still have a couple of blog posts backed up to work on, I promise I’ll get them out soon. The MAAM Conference about did me in, I’ll have to start a notebook of topics for a rainy day. I have two big projects to finish up this month and lucky for me I’m enjoying both of them. 1. For History and Theory of Museum – 15-20 page paper on the history of an institution/museum/collection. I’m researching the Old Barracks Museum in Trenton. What an amazing place with such rich history. Built as a Barracks in 1758 it has served as barracks, housing for indigent women, a house of ill-repute, a school, a hospital, a site for small pox inoculation and more recently a museum. Preserved as a museum by a group of patriotic women around 1902, this incredible piece of architectural history served as a nearby site to some of America’s most famous moments. I spent five hours in their archives the other day and wished I could have spent the night! How often do people really think of the history of a museum itself? Usually we are thinking about the history of the objects within the museum and in the case of the Barracks the former is perhaps the more interesting of the stories. 2. 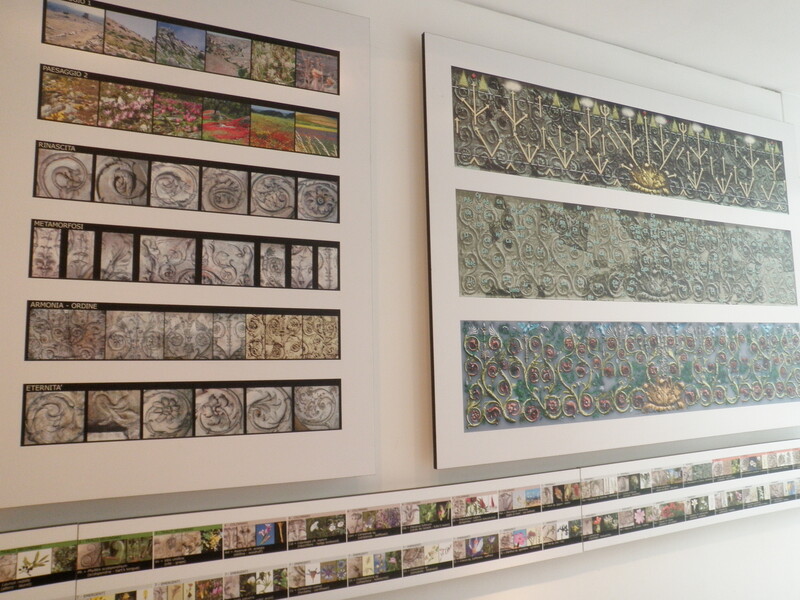 For Exhibitions A to Z – Create a theoretical exhibition from beginning to finish, as finished as it can be on paper anyways. 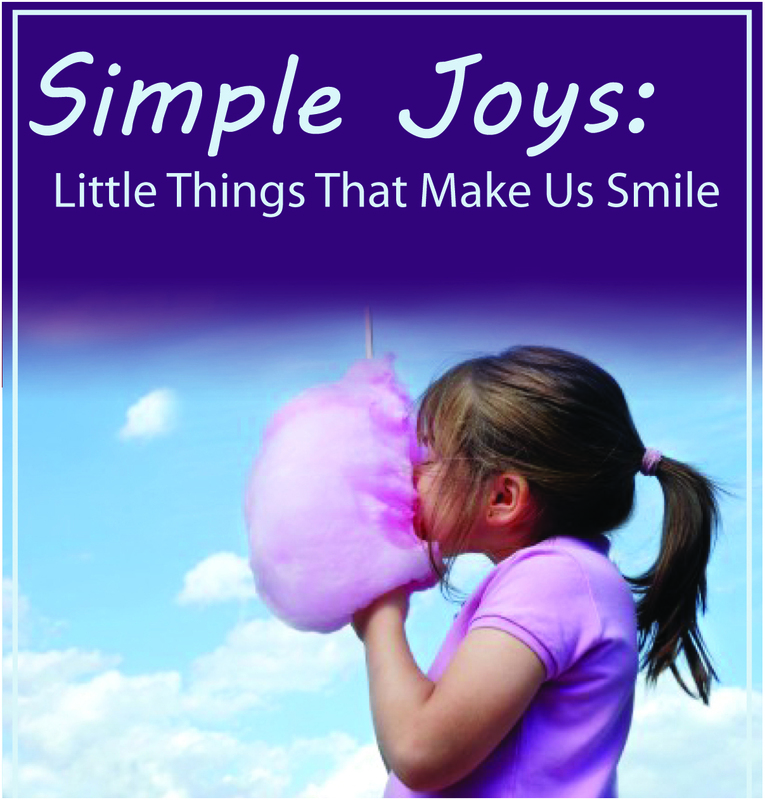 This has been a fun project for me, “Simple Joys: Little Things That Make Us Smile” is being kept in the dark until either finished or I find a space that ACTUALLY wants to let me do the exhibition. That’s my hope. The other big thing on my agenda now is finding an internship/job for next semester and summer. I’m hoping to come up with something amazing. I’m over having a job just to pay the bills, time to get back to the point at hand. Coming up in my agenda! Speaker: Carol Duncan, Professor Emerita, Ramapo College of New Jersey.